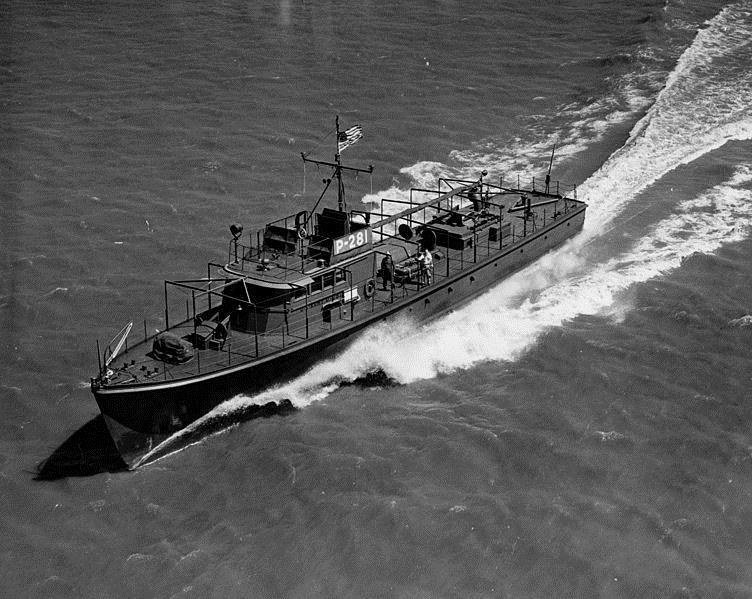 The fifth and final group in the fleet, designed before WWII, was the 104 foot rescue boat which was “comfortable and well-equipped” and could accommodate up to 23 patients in a fully stocked dispensary. During World War II they were frequently referred to as "Class I" boats. The 104s were able to stay at sea longer because of their longer length and because of their displacement hull they were better able to handle rougher seas. Its two main disadvantages were that it was very lightly armed and comparatively slow, with a cruise speed of 18 knots and a maximum speed of 21+ knots. The original batch were powered by three Kermath V-12 engines producing 625 hp. each and carried a crew of twelve. The later 200 series were powered with three Hall-Scott engines of about 650 hp. each. The 700 series boats were built toward the end of WWII and were originally designated as QS (Quick Supply) boats powered with 2 Packard engines of about 1200 -1500 hp. each (choose your source), which improved the boat’s performance. One generally knowledgable source states that P-749 through P-756 were reworked and renumbered QS-49 through QS-56 boats. In addition, the aft portion of the hull was redesigned to reduce her tendency to roll in even moderate seas and to add a cargo hold below deck and deck gear to handle freight. . From the accounts that I’ve read it appears that these boats were the best suited for operations around Alaska and the Aleutians and the preferred boat of those serving there. However, 104 ft. rescue boats served in the South Pacific and the Caribbean as well. Yards that built 104s included Casey Boat Builders in Fairhaven, MA: Ventnor Boat Works of Atlantic City, NJ: Brownsville Boat of Brownsville, TX; Stephens Brothers of Stockton, CA. ; but some sources maintain the best 104s for the 10th ERBS were built by Sagstad Shipyard, Seattle, WA. Pre-war Sagstad had specialized in building fishing boats for the North Pacific. The boat shown above has the framework for tropical canvas installed, but no canvas. At some point, I'm not sure but think probably after WW II, four were transferred under lend-lease, one to Cuba and three to the Dominican Republic. The basic numbers for the 104, model A, are as follows: LOA 104'-9"; beam 19'-2 1/2"; draft of 5'-3"; displacement 98 tons; fuel, 4000 gal. of gasoline;and 60 gallons of lube oil. Her fresh water tanks held 960 gallons. Not very fuel efficient, she could run for about 20 hours at full power, which gave her an operating range of about 400 miles at full power.consuming 200 gph. At normal cruising I'm sure she did considerably better but I have not found numbers to back that up. Thus far I have been able to document only a total of 86 boats having been built, not including 104' boats built as Quick Supply boats, although the "official" number of 158 boats may include them.